IT HAS stood as a landmark on Portsdown Hill since the 1950s. But Portsdown Main, the city’s former radar production site, has finally been pulled down. Demolition of the imposing Art Deco building started last year but in the past week the most recognisable parts of the derelict site have been reduced to rubble. 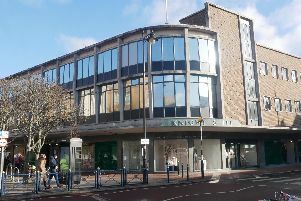 Waterlooville-based architect Mick Morris says the demolition is a sad loss for the city. He said: ‘It was a very distinctive building. ‘It had a lovely staircase, and the design was all simple metalwork and tall windows. ‘It always reminded me a bit of a cinema. ‘What I always thought was interesting was the fact it was designed by the war department but they didn’t originally know where they were going to put it. ‘That building could just as easily have ended up in a valley or in a naval base somewhere. Since it was built in 1952, Portsdown Main has been used by the Admiralty Signals Establishment, the Admiralty Surface Weapons Establishment, the Defence Evaluation and Research Agency, and then by the Defence Research Agency. Its doors closed for the last time in January 2007 and the building has been empty since. It is owned by the Defence Science and Technology Laboratory which had been trying to sell the site. But a survey declared the site structurally unsafe and the decision was made to tear it down. Mr Morris said he had hoped the building could be kept and given a new lease of life as a hotel. He added: ‘I regret the loss of it and it’s a huge shame it couldn’t be used for something else. ‘It could have made a hotel or something, because it is in a lovely location. ‘You have a perfect rural view in one direction and then the magnificent view of Portsmouth, Hayling and Gosport on the other side. ‘I’m currently designing what will be a modest block of flats to go on Portsdown Hill which will be in a 1930s style. Last year, firefighters spent hours fighting a huge blaze at Portsdown Main which caused damage to part of the central building.